Our Foundress, Blessed Brigida Morello of Jesus, a mystic and a prophet of predilection, was a pioneer in her own right when she founded an Institute, with the aim of educating young ‘girls’ of the city of Piacenza and named it “House of St. Ursula”. It was a great innovation, because, at the time, women were meant to be ‘mothers’, almost exclusively! 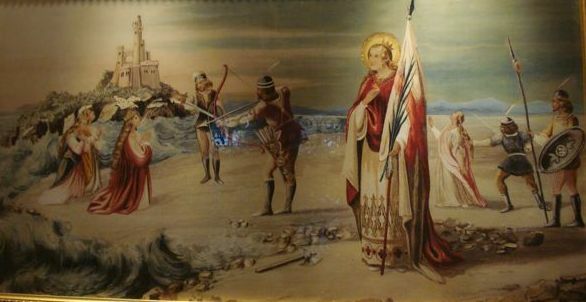 Mother Brigida chose St. Ursula as a patroness because of a legendary Saint Ursula who had shown heroic strength, fidelity and courage in defending a group of young Princesses from the attack of ‘pagans’ and lead all of them to prefer death/martyrdom, rather than give up their faith in Christ and their integrity. In fact, for such a courageous enterprise, there was need of an intrepid patroness. St Ursula was one of the Saints most in vogue/popular at the time. Even if what Brigida and her contemporaries knew of her was more due to legend than to history, she was considered a fitting patroness of educators. Successive archeological research has dismantled the image of the intrepid Breton Princess who faced martyrdom along with eleven thousand virgins she was guiding. We now know that the virgins were only eleven, but this does not diminish the value of a young woman who preferred death rather than renounce her virginity for God’s Kingdom. Like ours, many other Institutes whose members were ‘educators’ took the name of Ursulines.